Erich Bitter was born in 1933 at Schwelm, 30 miles east of Düsseldorf in central western Germany. Young Erich spent his childhood years with his parents who owned and ran a bicycle shop in Schwelm. At the age of 16 Erich quit school and started working with his parents. A cycle racing career was a natural progression but Erich also had the talent and at the age of 20 he turned professional. During his four years as a professional cyclist Erich competed in the Tour de France and rose to become one of the top German riders. Whilst his years as professional cyclist Erich built a close relationship with NSU. Since this company was not only producing bicycles but also cars they could be of great help when Erich planned a switchover to automobile competition. At the age of 25 he started to enter some competitive events. "At first everybody passed me" recalled Bitter, but it wasn't long before he started winning in an NSU. During his eleven year racing career from 1958 to 1969 he raced Porsches, Ferraris and Mercedes 300SL's, amongst others, before being offered a works drive for Abarth. In 1962 Erich Bitter launched a company called Rallye-Bitter to specialise in the marketing of tuning kits and car accessories. The business flourished and rallying equipment and his own Bitter "Nomex" rally suits were added to the product range. In late 1968 Opel invited Bitter to drive a new Rekord with 150bhp under the bonnet. Dressed in black and first nicknamed "The Taxi" but later also "Schwarze Witwe (Black Widow)", the saloon was more than a match for higher group Porsches with Bitter setting the fastest lap in its class. Those races in the Rekord forged links with GM's German management, links that would prove to be valuable in the years ahead. Bitter won both friends and respect at the Russelheim car maker. After his retirement from motor racing in 1969 Erich Bitter was appointed the official German importer of Abarth. This followed with the German concession for the small Italian marque of Intermeccanica. The Intermeccanicas were so poorly built that Bitter almost went broke trying to keep his customers mobile. The short, sour and expensive relationship with Intermeccanica was the spur that encouraged Erich Bitter into building a car of his own to German standards of quality and reliability. But he had learned something from his dealings with the Italian company. "They had the right idea, the car was a beautiful design and a top price. The market was small but the potential profits were very attractive. I believed that the potential was there and given the right conditions and a more rigid control of production, hand built bodywork and mass produced mechanical components can be a feasible basis for a car." Bitter had equally firm ideas about using proven Opel mechanical components. He believed that an Opel floorplan and running gear was one of his car's strongest selling points. Few top-of-the market alternatives offered supercar aesthetics and interior opulence combined with everyday reliability, argued Bitter. "I want a beautiful, fast car, but I also want to get in it and drive away." Erich Bitter made the decision to approach Opel at Russelheim and has never regretted it. He established his car business in his hometown of Schwelm in 1971. Between 1973 and 1986 he built 395 CD's and 488 SC's on proven Russelheim platforms and running gear. Between 1987 and 1997 Erich Bitter produced several prototypes but he could not raise sufficient finance to put them into production. His company ceased trading in 1997, but Bitter continued working in car design and engineering heading his own sub contracting company employing 50 people. The Bitter GmbH built prototypes for VW. In 2001 there were some rumours about a possible appearance on the 2001 Frankfurt Motor Show with a left hand drive Holden HSV with Bitter badge. Apparently this project was cancelled prematurely. On the 2003 Geneva Motor Show, however, Erich Bitter surprised the automobile audience presenting a new stylish coupé based on the Australian Holden Monaro. 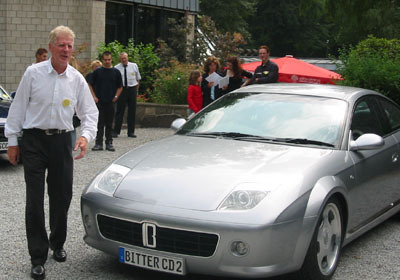 The Bitter CD2 has attracted a lot of attention of the press but after 3 consecutive appearances in Geneva the project was again cancelled. 2003 was also the year of the 30th anniversary of the Bitter CD and the 70th anniversary of Erich Bitter himself. In August 2003 the Bitter Club International organised a big surprise party in Erich Bitter's hometown of Schwelm. Erich Bitter wouldn't be Erich Bitter if he gave up easily. In 2007 he came back with the Bitter Vero, a big four door saloon based on the Australian Holden Statesman. The car was presented to the press and the Bitter enthusiasts community during an impressive show with the Bitter Horsepower phylosophy as theme. With its distinctive looks and exlusive trim the Vero should have been an alternative for the high end models of the European car brands, especially in Europe where the donor cars themselves are not often or not at all spotted on the roads. But only a handful of Veros were sold. In 2009 Erich Bitter managed to impress the European Opel management with the superb interior of the Vero and negociations started about offering a high end Opel Insignia with Bitter finish. For marketing reasons the cars would not carry a unique Bitter name but were offered as "Insignia By Bitter". In 2013 there was again a big party in Schwelm for the 80th birthday of Erich Bitter. This "80 years old youngtimer" was of course the center of all activities and attention. The parking lot of the hotel was completely filled with Bitters. Some enthusiasts brought several cars including some unique prototypes. There even was a rebuilt "Schwarze Witwe" and a preview of the upcoming "Adam by Bitter". The "Adam by Bitter" was officially presented in 2014 and the "Mokka by Bitter" followed in 2016. 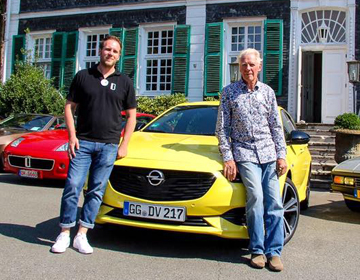 When PSA took over Opel in 2017 Bitter wasn't too worried and he approached PSA where he already was acquainted with CEO Carlos Tavares thanks to a common interest and history in car racing. In the summer of 2018 a new "Insignia by Bitter" was presented and during the 31st annual meeting of the Bitter Club International, combined with Erich Bitter's 85th birthday celebration in Schwelm, there even was a "Cascada by Bitter". All other models of the "by Bitter" range were also present as well as the rebuilt "Schwarze Witwe" and even the very rare Opel Styling CD. There was also a stand with "e.GO Life" electrical city cars. Since 2016 Erich Bitter is acting as an advisor for this Aachen based company and he also helped them connecting with PSA who is delivering technical components. Maybe we will see an "e.GO Life by Bitter" in the future. At the age of 85 Erich Bitter is clearly still very active but he is also thinking about the future of his brand and business. Together with his nephew Marcus Bitter he is making new plans for the next years and the continuation of the name seems guaranteed. 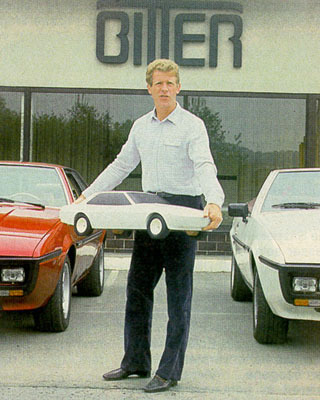 There will probably never be new Bitter cars but they will continue offering the exclusive "by Bitter" finishes of Opel models, possibly even with some high end engines reserved for the "by Bitter" models. From now on the cars will carry a "Bitter Edition" badge. Erich explained that Bitter is not just a tuner but a "Hersteller" (manufacturer). The range of merchandising articles will be further extended and in 2019 a showroom and museum will be opened in Rüsselsheim. Cooperation with a dedicated restoration company for Bitters and old Opels is under investigation.